If you don’t carefully read the back of your detergent, you could be easily be using an amount double or even triple the recommended amount without ever realizing it. Over use not only cost more, it can cause additional washing and rinsing to remove suds, build up and films, making your clothing look grey and dingy, and can cause odors in the machine and clothing. If you have a front loading machine, too much detergent can actually destroy various parts, especially encased bearings, causing expensive repairs. Post the facts about using too much laundry detergent and how to measure for other family members if needed. Consider taking your concentrated detergent and mixing with water in another jug if your family members keep over using – put that jug in front and they’ll happily use it never knowing the difference. Common pitfall: Many buy 2x or 3x concentrates and then use as much as they did before. How much do you really need? A tablespoon or possibly two for the largest loads. Even for especially dirty items, or even if you buy less expensive detergent. See above for all the reasons why. If laundry is especially dirty, pretreat and presoak. Less, in the case of detergent, really IS more. Check the pockets, check the pockets, check the pockets! An errant lip gloss or a few tissues in a pocket can mess up a whole load of laundry and cause a ton of work and/or waste. Expensive items stashed in pockets can be ruined…cell phones, ipods, etc. As needed, only, using the best method for the stain. The guide I use most often: Martha Stewart’s Pretreating Guide. I’ve printed two out and put them in plastic paper protectors. One is in my closet near my laundry basket, the other hanging near my utility sink. I also keep an old spin brush type toothbrush by my utility sink; it works wonders for scrubbing stains. Keep the lid up on top loaders to prevent nasty odors. Dry the ring on front loaders – they generally have a small amount of water in them after the laundry is done, and this can cause odors and mildew, resulting in having to wash clothes multiple times. Keep the door open. I never seem to have a rag when I want to do this, or at least not one that’s not just newly cleaned, and something about getting all the laundry done and then leaving a wet, nasty rag on the utility sink to dry bothers me…especially if it’s got mildew on it. Oh, and then washing it later with my clothing ‘icks’ me out a bit. Since I don’t use paper towels I got creative…I now take the lint from the dryer, wad it up and wipe out that ring with it, then throw it away. Something about finding a new use for lint just makes my day…oh dear, there really is something wrong with me! Remember to keep your dryer door closed to preserve the light. I chided a family member for leaving the dryer door open, and she said the problem was she could never remember which was supposed to be open the dryer or the washer…once I mentioned the one with the light on is the one that should be closed, look back before you leave the room, it was an aha moment for her. Wash and rinse in cold water whenever possible. There is really little to no difference in detergents formulated for cold water. The exceptions to the cold water rule are kitchen towels and rags, baby diapers, and perhaps underwear. If you do have someone in your household with an immune deficiency or skin issues, or infants, you may have to take special care with their clothing, but for the most part, those extra few degrees generally don’t buy a healthy person anything. Most clothes keep true to their colors longer when washed in cold, and exhibit less wear and tear and shrinkage. Keep in mind that hot water will set a stain, making it more difficult to remove. This does help your whites from becoming dingy. It also is a great way to just specially treat items that may need more care, such as your kitchen rags and sponges, etc. (Yeah, it’s never frugal to have to visit the doc for food poisoning due to cross contamination!) These I generally wash by themselves. Think about this especially if using hot water. Just don’t over dry your clothes and they won’t have as much static. Less environmental impact, less cost. Dryer sheets cause a build up on the filters of dryers and shorten the life of the dryer. Liquid softeners remove the flame retardant film found in children’s nightwear, clothes for camping, sleeping bags, etc. If you must have soft towels, consider doing a separate load and only using fabric softener on those. If you do use softener, use less than the recommended amount. Don’t leave your clothing in the washer to mildew or smell. You may need to wash it multiple times to remove the smell, and perhaps may need to use special products. 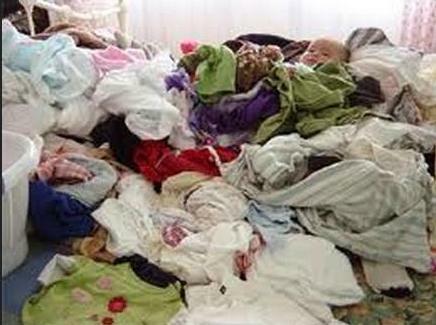 Kids love to throw clean clothes down them when they are cleaning their room. Wet items sit in pile with other clothes, sometimes causing “bleeding,” mildew and odors and ruining items. Sorting becomes overwhelming and it is disheartening to see a pile of dirty clothes every time one walks into the laundry room. Matching and folding for various family members all at once is time consuming – who’s socks are those? Errant items love to fall out of the basket and find their way into odd places like behind the washer or on the floor and may get kicked under appliances. Family members looking for clothing seem to relish in going into the laundry room, digging through things and then washing only the items they need, sometimes scattering all the rest of the dirty laundry on appliances and floors. Remove clothes from the dryer promptly, and fold or hang. Running the dryer more than once, even to air fluff is going to cost you. Hanging clothes promptly will eliminate almost all need for ironing. Hang items or dry flat when possible and time allows. Less wear and tear on your clothes, less cost. Sweaters, especially benefit from this. A compromise? Hang dry your clothes and then pop them in the dryer to tumble when done for two or three minutes to soften and remove wrinkles. A note for women, gynecologists recommend using a dryer for undergarments; even though it may be harder on your lingerie, keep this in mind. Ailments are NOT frugal. Both in the dryer and where it connects to the piping. Check especially if there are bends. Check outside several times a year as well. The dryer operates more efficiently and lasts longer when it‘s not all clogged up with lint. You’re also reducing your risk of fire by keeping the dryer and vents clean. Lint is highly flammable, and one of the top 10 causes of house fires. Don’t rewash clean items or keep washing items that aren‘t really dirty! This should go without saying, but I’m sure we’ve all tried something on that didn’t work, thrown it on the bed (or chair or exercise equipment you always mean to use and keep in your bedroom) only to have it end up in the laundry on wash day. Kids are notorious for generating a lot of clean, ‘dirty’ laundry when they clean their rooms! Consider docking the cost of the extra laundry loads from their allowances. You’ll probably only need to do this once…most kids are pretty savvy about finding the easiest, simplest way of picking up, and if they can get YOU to fold their clothes, by way of washing them again, they’ll do so. Decide if you really need to wash a towel every time you use one? A lot of people don’t, just hang immediately and let completely dry. Same goes, especially, for jeans. If they aren’t wrinkled, haven’t been spilled on and still smell fresh, wear them again. Are there items you’ve worn only for a short bit of time that can be aired and worn again, especially if a shirt or undershirt were worn under them? Can you install a hook or pegs in the bathrooms or bedrooms of family members for these items if they can’t seem to fold and put away or hang? Read your garment’s tag and know how to wash and care for it properly. Train your family how to sort special items out from what they throw in the general wash. Consider multiple hampers, one for darks, one for lights and one for anything needing special care. Bottom line: Most laundry detergent do a good job, even the best need some help with stains. The more expensive ones may be better at a specific stain like grass, for instance. My conclusions are on Laundry Detergents and Products. Consider buying in bulk from box clubs stores or off the internet. Use coupons – I never mind getting paid to try a product, especially if it’s cheaper than what I might have bought otherwise. Stock up when it’s on sale. Try making your own. I have not tried this recipe, but my daughter uses a similar one with very good results. I noticed a huge difference in my electricity/gas and a little on my water bill and used a lot less detergent. I got a great deal on mine – I read the Consumer Reports articles and then bought it on a Black Friday sale (one of my two Black Friday shopping experiences) and they paid for themselves within the year. Your results may vary depending on the cost of your appliances and how often you do laundry. Have to pay to have your old appliances hauled off and new hooked up? Find someone who needs your old ones (if working) and have them take them. Hooking up the new is a cinch if the plumbing doesn’t need to be moved. Watch a YouTube video or google. Don’t forget to see if your power company offers a rebate for switching to an energy efficient option. Pros and Cons of High Efficiency? See this article by Good Housekeeping. Keep them running and in working order for efficiency and safety. The greatest cause of household fires is your dryer, and of household floods is the washer. This Old House has an excellent article. Don’t keep detergent, fabric softeners, etc. on your appliances – spills may permanently stain the finish. This entry was posted in Frugal Helps and tagged Martha Stewart, Saving on Laundry. Bookmark the permalink.